Please admire the picture of the empty sample bottle at left. I failed to take a photograph of it before drinking the contents. I did remember to take tasting notes on it though, so that’s something. So far this month my whisky reviews have included an entry-level malt available in a few countries (the Highland Park 10) and another entry-level malt available pretty much everywhere (the Macallan 10, Fine Oak). 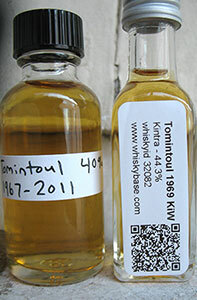 Here now is an entry-level malt that is not available anywhere (other than at auction). This is in case this blog was in danger of becoming useful: you’re welcome! Once again, the “Quick Hits” notes are briefer takes on whiskies I only have small’ish samples of. No ratings for that reason.